Habitat moorings provide refuge cavities and tunnels that attract numerous species of fish and crustaceans, plus bio friendly wall surfaces that support myriad aquatic plants. This oasis effect has been extensively documented at two locations on the Maine coast by Christopher Roy, a Graduate Student at The University of Maine. 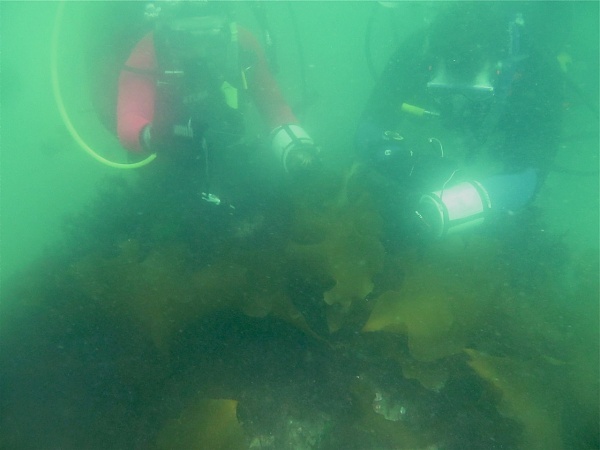 In a series of dives spanning 2012 and 2013, Chris and his University of Maine colleagues studied Habitat Moorings at Seal Harbor, on Mt. Desert Island, and Sand Cove, near South Bristol. 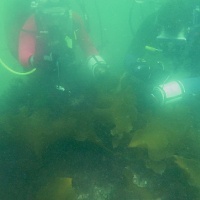 The team catalogued over 50 species of marine animals and plants aggregating on the moorings. Moreover, the Habitat Moorings showed vastly more marine life and biodiversity than control granite moorings that were located nearby. Christopher Roy, Graduate Student at University of Maine and Lee Ann Thayer, Marine Biology Student at University of Maine, ready to depart for Seal Harbor. Lee Ann, Mt. 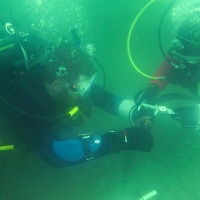 Desert Harbor Master Shawn Murphy and Chris check collection bag before dive. Some of the equipment required for the field study. Note the scraper. Chris Roy and Lee Ann Thayer approaching a Habitat Mooring at Seal Harbor, Maine. The mooring is completely covered in aquatic plants and virtually unrecognizable. The same mooring after Chris and Lee Ann have scraped it clean. They did this in order to study the rate of new growth on the mooring, as compared to a nearby granite block of comparable size. 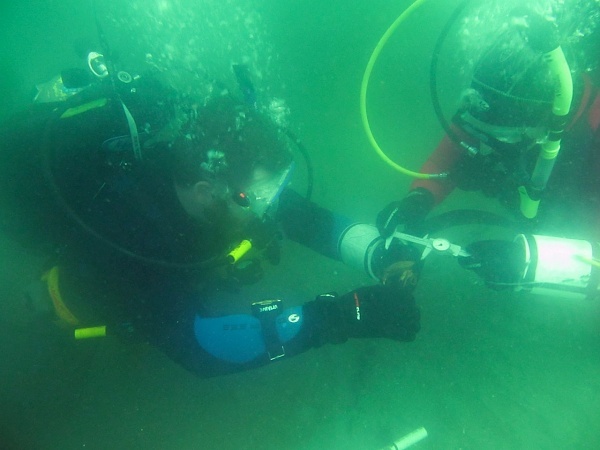 A grid helps divers inspect every inch of wall surface. The smaller tunnels are 2” in diameter, the larger tunnels are 3” in diameter. American Lobsters were found in all levels of chambers on the Habitat Moorings. Adult Lobsters like the one held here, were usually found in lower chambers. Atlantic Flounders, like this juvenile, were sometimes found on the flat top portion of the mooring. Over the course of the field study, 7 species of crab were recorded on the moorings. Small Atlantic Cod in collection net. Amazingly, on another dive, Chris collected a 17” Atlantic Cod from one of the 3” diameter tunnels. The top pocket on the mooring, with recessed hitch rod and chain link, became a desirable cavity for many varieties of marine life. Usually retreated, but not always. This guy stood his ground. Sand Cove, near South Bristol, Maine. The Habitat Mooring is under the white float that is to the right of the lobster boat in the center of the picture. Chris and crew were able to swim out to the mooring from shore, towing their collection gear in a small raft.